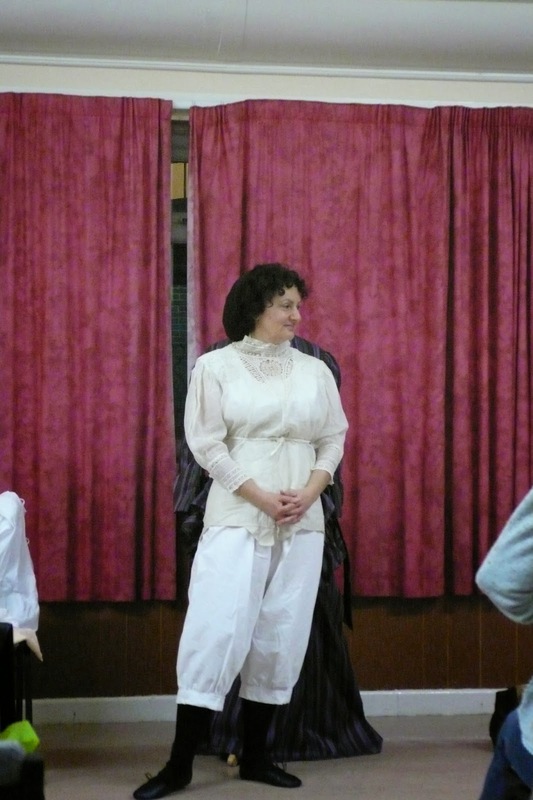 On Monday evening, Cathy and Joanne gave us a very informative and amusing talk about Victorian underwear. They explained how the female silhouette changed during the nineteenth and early twentieth century and the lengths to which women had to go to achieve the perfect figure. 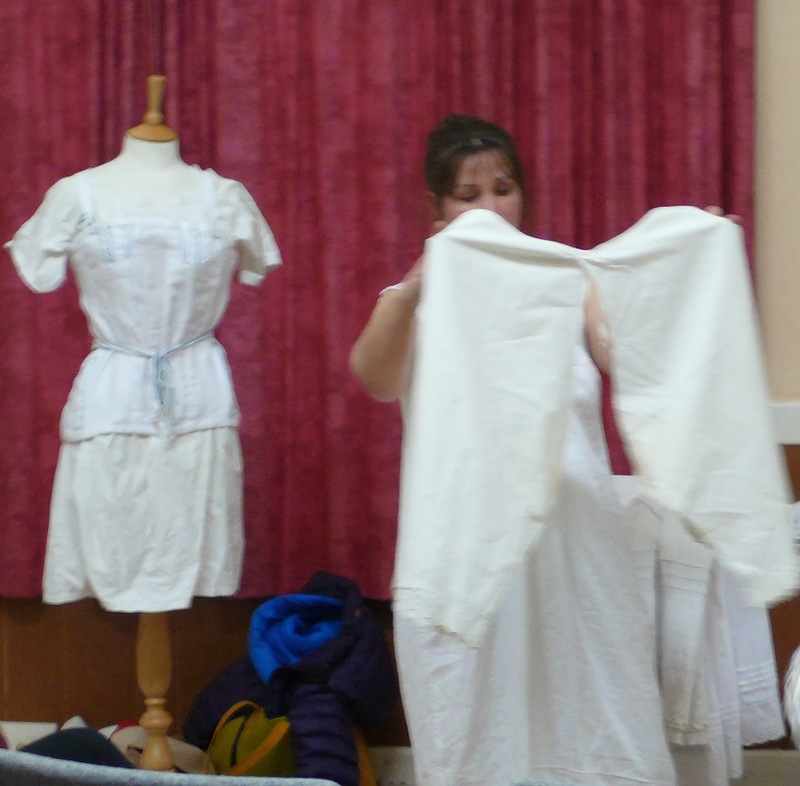 Starting with a chemise, Cathy and Joanne showed us the layers of underwear required to meet the fashion of the day and brought a whole new meaning to the nursery rhyme 'Lucy Locket lost her Pocket'! 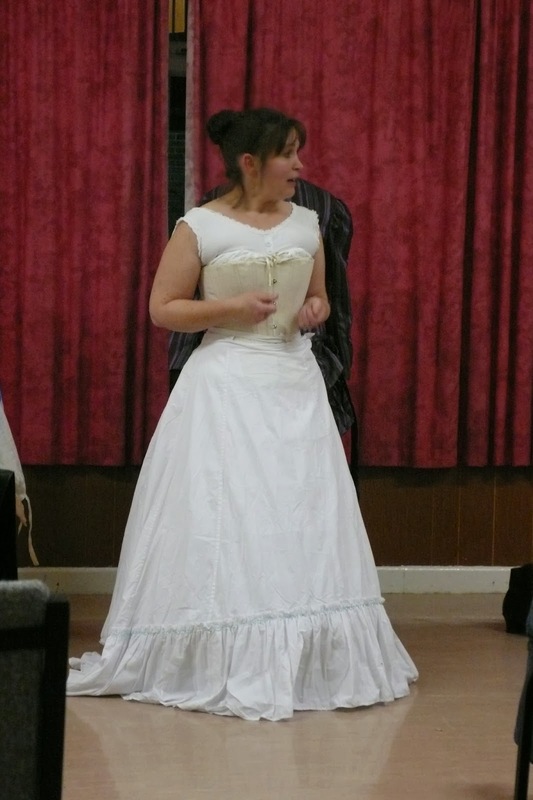 Although the Victorians were 37% smaller than we are today, it was definitely the age of big knickers! 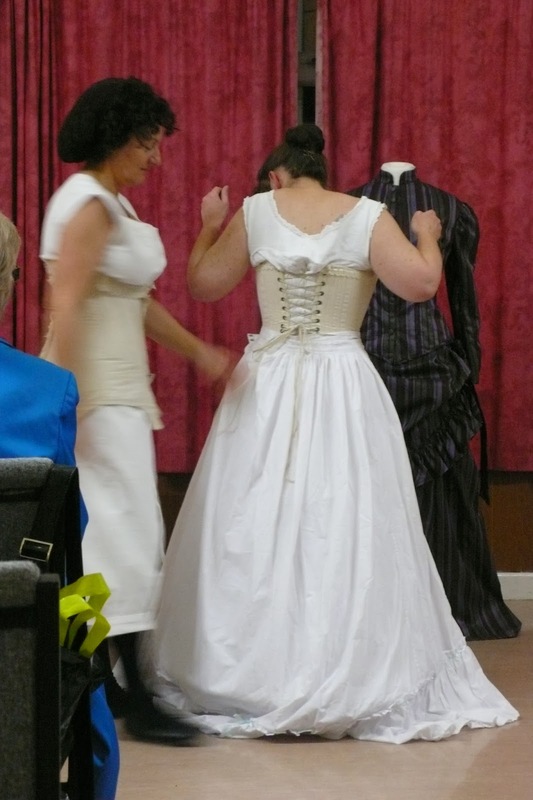 Joanne laced Cathy into her corset. After the body became used to the restriction, the laces were tightened, to create the perfect waist. Needless to say, a great deal of damage was done to the internal organs of the wearer and movement was severely limited. Corsets were worn from the age of 8 and there were even pregnancy corsets. 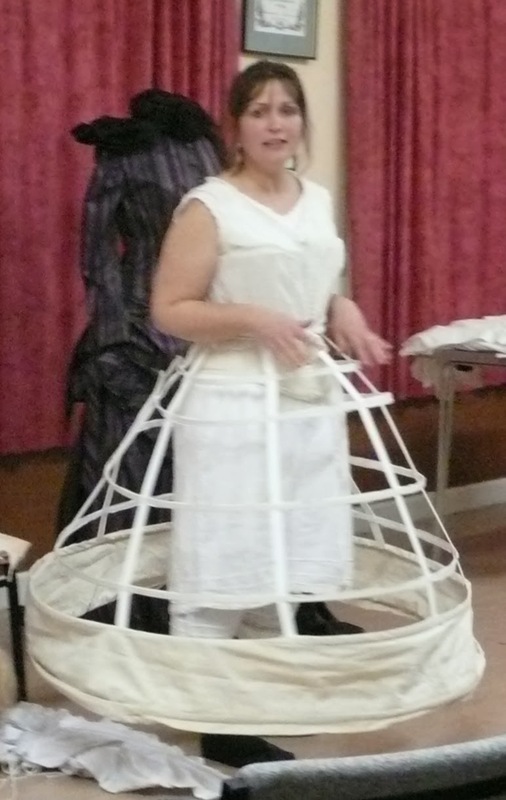 Over time, the corset changed and became less restrictive and then the crinoline arrived on the scene. It was made from steel, leather and horse hair. As the century progressed underwear changed again. 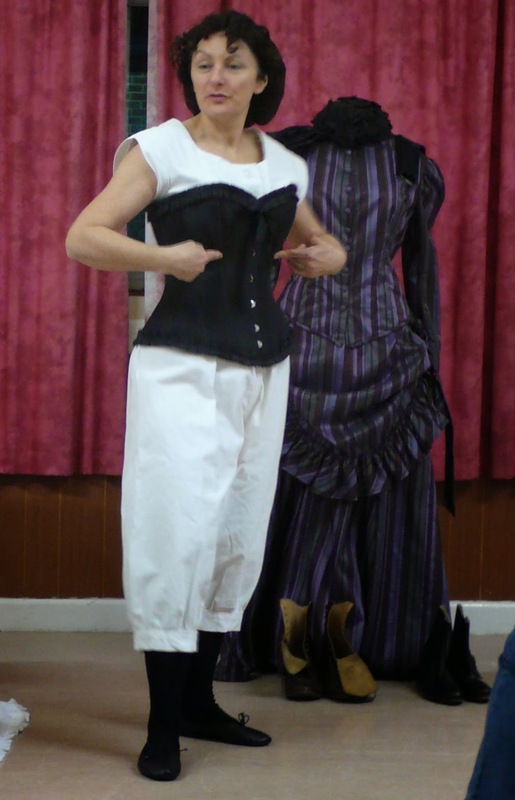 Here on the right, Jo is sporting her combinations with a black mourning corset. By 1920, the female figure changed to a straighter form. 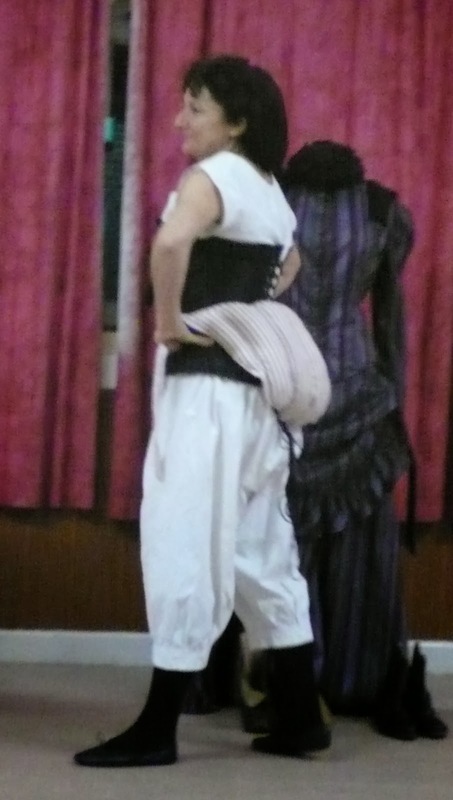 The restrictive corsets of the previous century were gone and underwear was more comfortable to wear. Thank you Cathy and Joanne for a great evening. 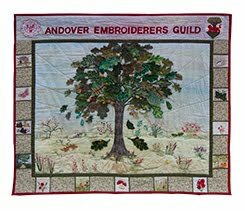 Next time we are in the M&S lingerie department, we'll have to remember how lucky we are that stretch fabrics have been invented!